Dehydrated zucchini Choose young, slender zucchini. 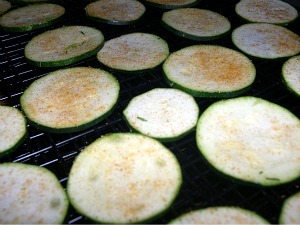 Wash zucchini and cut into 1/4-inch slices for cooking purposes or 1/8-inch slices for chips. Dry in a single layer in a 125° oven until brittle. Use slices in soups and casseroles or sprinkle zucchini chips with seasoned salt and serve with dips.